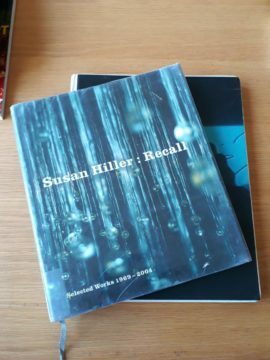 This blog will document the development of my practice and my PhD thesis Traces and What’s Left: Constructing a Communicative Form as an Art Practice as research in the Music Department at the University of Aberdeen. 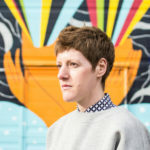 I’m beginning this blog as a way to reflect time as a part-time PhD researcher and as a way to document parts of my art practice and my developing thesis. I’ll be updating and writing regularly and over the course of my studies, I hope that this will become helpful for myself and those considering a practice-based research degree. In the autumn of 2017, I was invited to develop a piece for presentation for the 2018 sonADA festival in Aberdeen. This would be a live performance and I was reassured that as long as I made some sound, I would be fine. As an aside, I had NEVER performed live before as much of my work has tended to be developed for sound and video installation or for broadcast online or for radio. So, taking the bull by the horns, I jumped in feet first and tried to put my initial trepidation to one side. 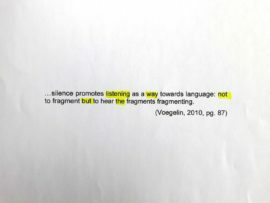 I wanted to make sure that what I presented linked to my research topic Traces and What’s Left: Constructing a Communicative Form as an Artist Practice which focuses on erasure as a methodology and asks When does erasing become narrative? in art practice. I also wanted to present work that was current to this thesis and not re-present an older work. I chose to develop a live performance of Not Everything That Can Be Thought Can Be Said, created in 2017 during my 1st year of research. This was initially presented as a sound installation for the exhibition The Space Between (2017) at Patriothall Gallery in Edinburgh. 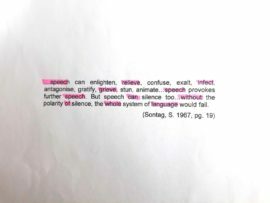 A series of spoken quotes from the writers Susan Sontag, Luc Tesson and Salome Voeglin that all discuss silence have been recited and recorded with all word content deleted. What is left are the beginnings of words and the presence of a body and the words that were not spoken with the focus on what is missing. For sonADA I revisited this piece and embarked on creating a version for live performance. 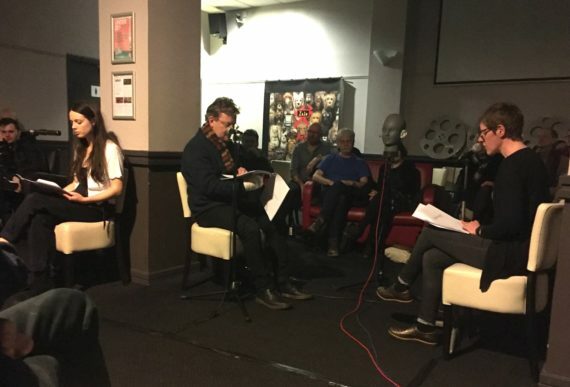 Three performers recite three scores, the texts taken from the writers Susan Sontag, Luc Tesson and Salome Voeglin, each reflecting on silence within art, life and sound. 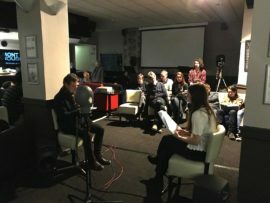 Each performer focuses on only communicating the beginning of each word, enabling meaning to become fluid and move between truth and fiction. What is left is the presence of a body and the words that were not spoken. Focus is on what is missing, with the viewer able to construct and create their own meaning based around the words they almost heard. During the development of this piece, I scheduled two rehearsals with an additional rehearsal on the evening of the event. Here we focused on our running order and went through each text to create our individual scores. We also discussed tone of voice, delivery of our speech and rotating around the performance space three times to signify each of the three texts. Live performance for three performers with three text scores. Commissioned and presented for the sonADA Festival: Sound of Others (2018), Aberdeen, Scotland, UK. For practice-based research, creating and applying a methodology has it’s challenges. For many artists, art works are developed with different goals and themes that can make applying a recurring working method difficult. This also applies to my work, however, I have been breaking down my working process for each piece, so that this becomes clearer and I can see where there are similarities to my approach across my art practice. 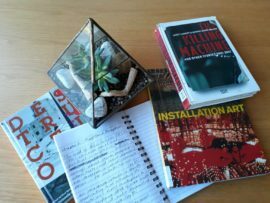 Readings & Research – I always read when I am developing new work. This might be to learn about a particular theme or idea I’m working through or it may be to familiarise myself with an artists’ work who I feel is exploring similar themes to myself. I also write, and note-taking is one of the processes that I have benefited from throughout my career. Instead of a visual sketchbook, I have a diary of sorts where many of my thoughts, ideas and to-do lists are collected. Recording – I usually have a still image, or a set of sounds in my mind that I want to capture. Next, is to set out to record this material. I over record, making sure I have more than enough footage. Sometimes I will record numerous ‘takes’ and then I can choose which to take forward. At this stage I might also have an idea of how I imagine the form of a 1st edit of this material and also some presentation ideas for the work. Post-production – Next is creating a first edit of the footage. I have been working where I strip back much of the content, leaving a minimal amount of edited material and I apply effects such as EQ, compression and digital filters to this. Working in this way may take the form of erasing one voice of a conversation or removing video footage so the source of the conversation/event is unclear. 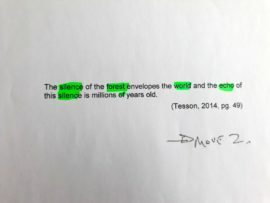 This ‘erasing’ is where my thesis will focus on, the creation of a new ‘communicative form’ by deconstructing digital material and presenting this ‘fiction’ to the viewer. Presentation – I have presented work through installation, broadcasts, online websites and collections. I am also exploring live performance elements as part of my research. I see this as not necessarily the final stage for the work, but another opportunity to try something out. I’ve shown the same work in multiple venues as each time it changes and becomes a new iteration of the piece. So although this is the last stage of my methodology, the result may not be the final one. Finding Support – My academic career has given me invaluable support to develop my practice. I have been fortunate to work with academics who truly see the subtleties and nuances in what I create as assign this with as much value to understanding the world as I. Online and peer support is also important, especially artist opportunities through exhibitions and residencies where you get a change to play and experiment. Additionally, be seeking out and creating your own support network, you can be challenged to build and strengthen your working methods. One of the hardest parts of any new period of study, research or creative practice is moving on from older work and managing to keep the creativity flowing. I’ve found this challenging and probably even more so that usual as there is that ‘PhD Pressure’ looming and hovering around. At times, I worry that I’m not making enough or not reading enough. As a part-time researcher, it can be tricky to be comfortable with your time management as there are other commitments to give time to. I chose to study part-time for these reasons as sometimes I do worry – I’ve lots of different hats to wear throughout my week so finding dedicated time to research has it’s ups and downs. This week has been focused on working on some new audio work that I’ve been developing over the last few months. I’ve managed to get in an afternoon of dedicated editing time and I’m happy with what I achieved. There’s a little more to go for this piece but I’m happy with the progress so far. As well as editing work, I have been researching articles and texts for further readings and I have been working on some development and admin for an upcoming live performance of my first PhD portfolio piece. There are a few more hours in the day so now I’ve done my dog walk, I can sit back with a (decaff) coffee and dive into ‘Installation Art’ by Claire Bishop (I’ve only been meaning to read it for the last 2 months). This post is a reflection on the challenges of developing my theoretical position and how this underpins my practice and work. As my research is practice-based, theoretical writing is optional but is something that I am interested in. However it has been a bit slow to get started and there have been updates and changes over the last year (positive ones)! My research will be a series/portfolio of sound/art works and documentation with a theoretical paper accompaniment to support my position. Initially, my approach (and previous work) has involved linking sound and digital art practice with the everyday (quotidien), spoken word, game structures and playfulness. These are concepts that have underpinned my work for the last 10+ years and are always present within the work I create. 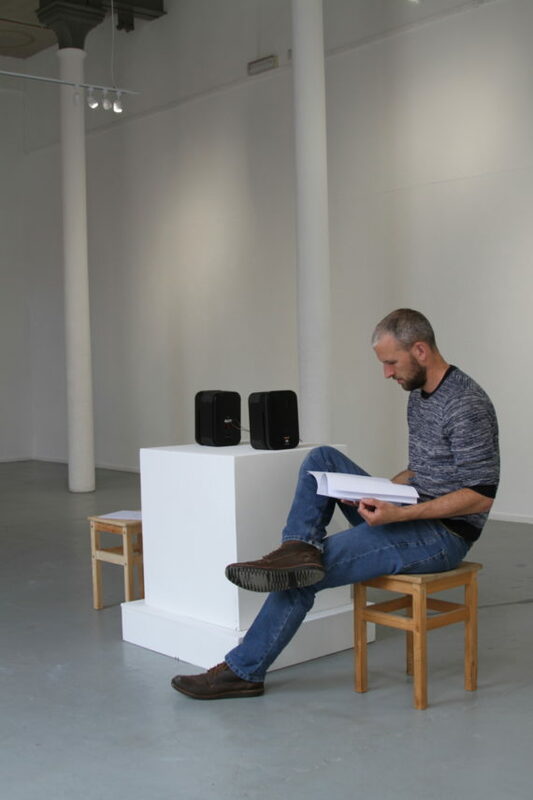 The aim of this paper is to explore the body of art theoretical work surrounding the sound arts and how this art form relates to interdisciplinary art and the quotidian as explored within art, Fluxus and the intermedia concept. The exploration of these topics will be framed through the creation of artwork and theoretical research that investigates playfulness, humour and intimacy within art. Artists’ work that explores and is rooted within play, humour and the everyday through a sustained body of work and theory will be analysed. However once I began my research and developed my first thesis artwork my position shifted as I began to analyse this new piece with my supervisor. Essentially, I realised that my work (and previous portfolio) has been identifying and creating ‘communicative forms’ that explore human interactions, play, games by presenting work that sits between reality and fiction. My research and investigation into this topic focuses on how we, as artists’, create and construct communicative contexts within practice. With my focus on sound, my practice-based research will question how artists create and present communicative forms and how these are expressed and presented through artwork. 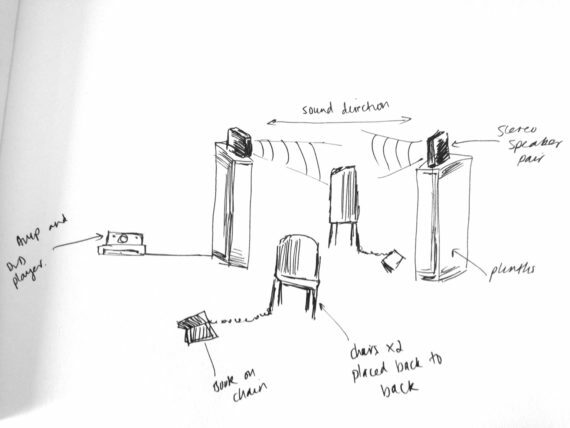 This work takes the form of recorded speech and observed human interactions where the original narrative becomes questioned and a new, quasi-fictional narrative ‘constructed’ by the artist through digital sound post-production, the creation of artworks and the display of art installation pieces. The original is always referenced, however the viewer is experiencing a new form of this narrative. 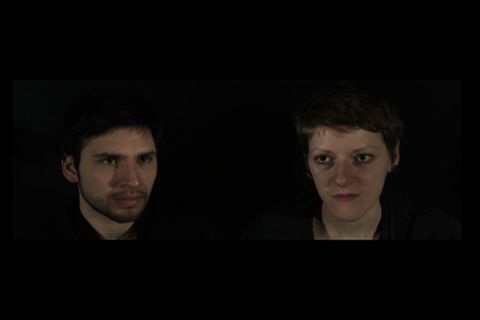 An example of this approach is the piece When I Close My Eyes I Can Still See Your Face (2011) that presents two individuals entering a staring competition. Over time the viewer realises that each person is staring at an off-screen ‘other’ and that the selection and edit of video material has been ‘composed’ by the artist. With this realisation, the work suddenly moves from reality and enters the realm of fiction. When I Close My Eyes I Can Still See Your Face (2011) from Kim Walker on Vimeo. The link above is to an older piece created as part of my MFA Thesis at the School of The Art Institute of Chicago. Now that I am able to apply the above approach to my previous work, I can see new connections and ideas that I have been working with all along! I am half way through my PhD first year in the music department at the University of Aberdeen. Over this time I have focused on my thesis topic, re-focused on my thesis topic and changed my topic! I have started to make new art work that will become part of my thesis portfolio and I have attended meetings of my department’s Sonic Arts Forum. I have met my supervisor for our regular monthly tutorials and this has been the bedrock of my research and is one of the opportunities I have to discuss my work, art opportunities I am considering and any funding or projects I aim to pursue. I have also managed to get my weekly routine established. This makes sure that I have dedicated research time (1 or 2 days per week schedule depending) and time to dedicate to my job, freelance work and leisure time. I aim to contribute to this blog on a regular basis so keep updated to learn more about my experiences on my PhD journey.